Last year, popular Pakistani singer-songwriter Momina Mustehsan appeared in a soft drink TV commercial where she is shown to surprise a few young men with her football freestyle skills. Pakistani squash player Noreena Shams responded to the ad with a post on Facebook complaining that real women athletes were ignored by the advertising industry, while pop stars were being given a platform to show off sporting skills they did not actually possess. Mustehsan, who is one of Pakistan’s biggest music stars, says a lesson was learnt from that post. A few months later, when the singer was asked to act as a spokesperson for a series of friendly matches featuring international footballers to promote the sport in Pakistan, she had a chance to make amends. She told the organisers she would do the gig only if the captain of Pakistan’s women’s football team, Hajra Khan, was also brought on board. 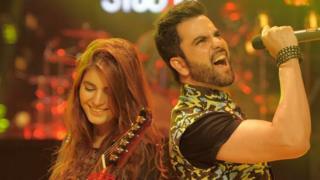 Mustehsan achieved overnight fame after making a dream debut on the programme Coke Studio, the most highly-rated music show in the country. She sang a duet with Pakistan’s most acclaimed singer Rahat Fateh Ali Khan. The song, Afreen Afreen, essentially a paean to female beauty, catapulted the young singer into the public eye. A video of the performance has since been viewed nearly one billion times on YouTube. Mustehsan retains a massive youth following and has picked up a dozen lucrative sponsorships, ranging from beauty brands to the national airline. But success has not come without a price, and Mustehsan has had to deal with vicious online trolling. Mustehsan worked through these issues by sharing her experiences on social media, campaigning against cyber-bullying and consistently supporting young female followers who came to her for advice. Recently two of her videos with the hashtag #depressionisreal had nearly a quarter of a million views on Instagram, opening up a space for frank discussions about mental health. 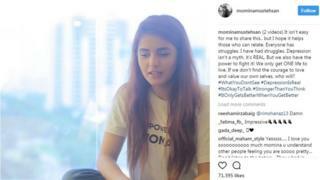 With her posts estimated to reach some 20m people each month, Momina Mustehsan is one of Pakistan’s great social media influencers. Other female celebrities such as the Hocane sisters (Urwa and Mawra), who are both successful actors, have larger followings, but tend to talk about fashion. When Mustehsan talks, girls who idolise her tend to listen because she chooses serious topics that resonate with them. She encourages young women to believe in their own beauty without the manipulations of mobile filter apps, and is known to take on trolls who question women’s rights to move freely in public spaces with sharp repartees. She has, however, upset some Pakistani feminists by criticising the murdered provocateur and internet sensation Qandeel Baloch for using her body to get media attention. If there was a millennial re-working of the Spice Girls, the Pakistani superstar could be cast in the role of Sporty Spice. At the age of 12, and living in the conservative city of Quetta, she took up show jumping, and continued to play tennis despite friends of her parents worrying she would get too tanned in the Pakistani sun to find herself a husband. As the “Empowerment Champion” for Islamabad United (ISLU) cricket team in the Pakistan Super League, Mustehsan speaks out regularly about the lack of gender parity in sports. She has also come out to support the reclaiming of public spaces by women. “If you go out for a jog you feel threatened because all of these men start following you, cat-calling and whistling at you,” she says. Four women who play for the Pakistan national team also play for ISLU. Mustehsan teaches them singing, and they reciprocate with cricket lessons. “There were other teams who wanted me to work with them, especially after [the hit] Afreen Afreen, because I was this face,” she says. But while she could have earned more with another team, she says she chose ISLU because it focuses on getting girls into sports and it is co-owned by a woman, Amna Naqvi. “If you see more women in sports it normalises it. You’re saying this is a woman’s playing field and women can be decision-makers,” she says of Ms Naqvi. The team owner, meanwhile, calls Momina “an inspiration for the women of Pakistan”. Momina and the team will in November run cricket camps in all-girl schools in Islamabad and Lahore where girls are not encouraged to take up sports. “Women face discrimination in sport the world over. The reason we don’t have more Serena Williams is because we don’t really have the same facilities and coaching for women that we do for men,” she says.